Calving is just getting underway on the ranch. The heifers (first time Mommas) are nicely starting. Heifers are young, inexperienced mothers, so they often need a little help with their first calves. We check them every couple of hours to make sure everything is going well. Today on my second heifer check of the day, I had the full range of the ultimate highs and the ultimate lows of ranching. I noticed two heifers off behind a bush and knoll that I had not noticed during my check a few hours previous. One was clearly in distress, so I trekked through the trees to take a closer look. 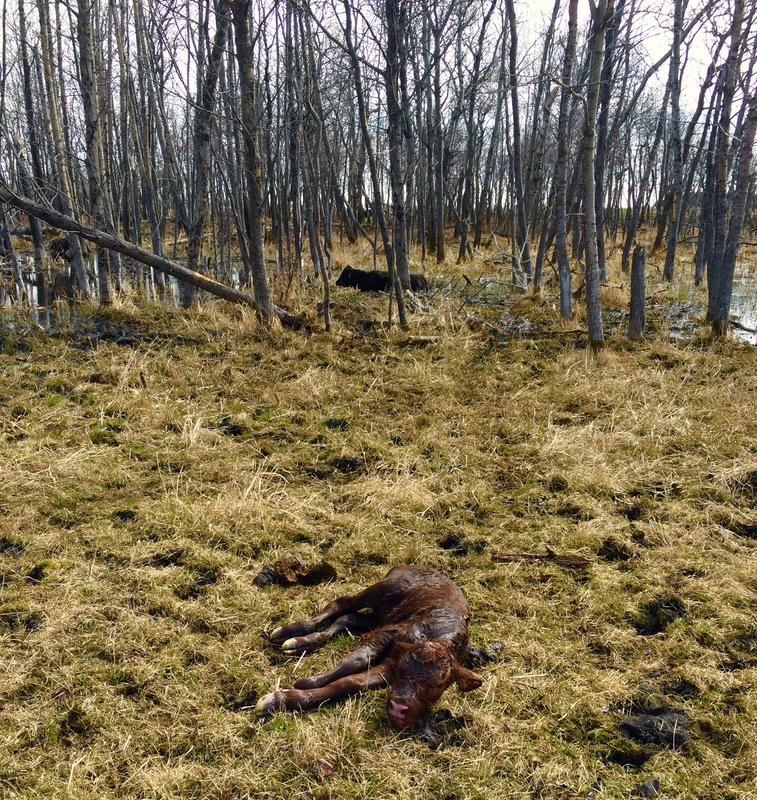 Things did not look well for either of them – they were both in distress and having trouble calving. I called Aaron for backup as he is our difficult calving expert. Of course, he was on the farthest corner of the ranch, and would take a half an hour to get to where I was. While waiting for him, I had a closer look, and my heart sank. Neither situation looked good for the calf, or the heifer. I moved the red heifer up to the calving chute to where Aaron would best be able to help her. As I headed back and got closer to the black heifer, I could see this was a bad situation as well. She was in severe distress herself, and couldn’t get to her feet. The calf’s head and feet were showing, but the bag had not broken. The calf’s nose was swollen, a sure sign that she had been calving for too long. I quickly broke the bag with my fingers, just before Aaron showed up. His arrival startled the heifer – she lurched to her feet and stumbled out into the middle of a small slough (marsh) before collapsing again. We followed her into the slough, mindless to the water filling our boots, to pull the calf right then and there. We were standing behind the heifer in thigh deep water, Aaron pulling the calf, while I held it’s head above the water so it wouldn’t drown before it was even fully born. As I cradled it’s head I wondered how many people get to have an experience like this. I am making a difference for this calf. I am helping to save it’s life. It was a moment not completely unlike when either of my children were born and first placed on my chest – all the commotion around me faded away as I stared into the calf’s eyes and fully embraced the moment. We managed to get the calf free and hauled it out to dry land, where it snorted and chuffed and sneezed the fluid out of it’s nose. It gasped for breath and looked up at me with one eye, seemingly to say “what the heck just happened!”. It took every bit of our skill, teamwork and energy, but we did it. We saved the calf. My momentary high was cut short when I realized we still had the other difficult situation to deal with. My heart sank to the bottom of my stomach as I knew the likelihood of saving the next calf was slim. We got her into the chute, and my fears were confirmed, the calf was dead. As much as I knew it wasn’t farm girl tough, I choked back tears. In all the years of farming, these are the moments that make you question if you are cut out for this job. This life lost is the lowest of the low – not when you make a marketing mistake and lose hundreds of thousands of dollars, not missing your child’s first ball game or horse show because you were too busy farming, not when you lose a crop to frost, or BSE hits and you lose the majority of your livelihood. This life lost cannot be regained – and the worst of the worst – it was my fault. It was preventable. If I had spotted her on my first check, it would have been an easy pull. Healthy calf, healthy mom. But I didn’t, and it wasn’t. 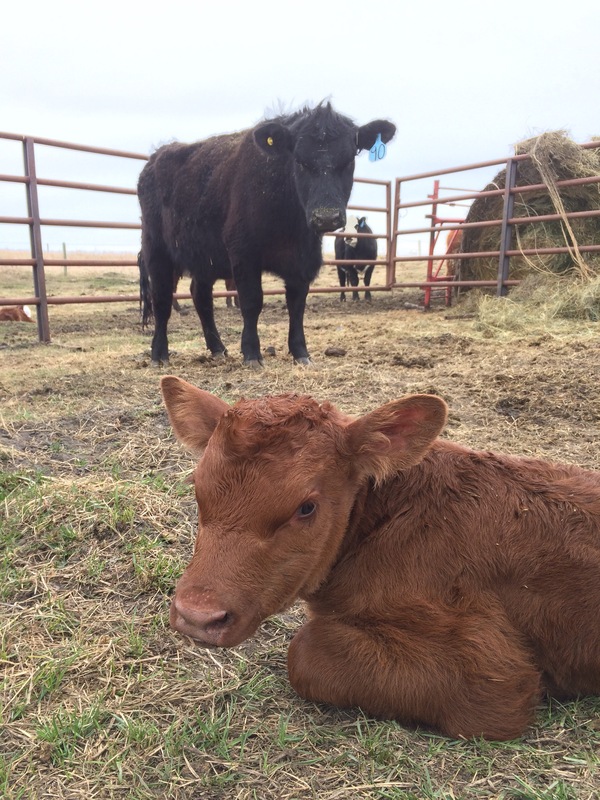 There are over a thousand calves born on our ranch each spring. Logic tells me that there will be lost calves. As hard as we try, there is no human way to save each one. But this moment of a lost life due to pure human error – that stays with you. Even now, hours later my stomach is clenched. It is a moment I have to live with. The only good I can find from this is that next time I will do better. I will look more closely. I will try harder. I will learn. Now as I check on the weak but improving new momma and calf I smile, but as I quad away, it must be the wind causing the tears on my face. I am a tough ranching woman. It’s the wind. It must be. Mom and calf have bonded nicely, and are in full recovery! Thanks for sharing. I remember being on my Friends farm as calves were being born. What a beautiful, heartaching story. Do you name the calves when youll have 1000? If not, can we just name the little red one? Can we? Can we, huh, huh??!? We only name the ones that need special care – but the red guy has not yet been named. Go for it! I am sure you have a good one! You brought back memories of myself going out with my dad to check cows when I was a kid. We ran into many situations like yours. What I wouldn’t give to go back to this life, even with the sad endings.